Located in southwestern South Dakota, the rugged beauty of Badlands National Park’s buttes, pinnacles and spires mark terrain once roamed by giant Pleistocene-era beasts. Sabre-tooth cats, rhinoceroses and other bygone creatures once called this wilderness home, leaving their fossil remains in the ancient rock. The Badlands National Park operates a Night Sky Program during the summer. Visitors get the opportunity to witness a 40-minute, multi-media presentation about the universe given by one of the park’s knowledgeable rangers. The rangers point out glowing constellations in the vast night sky. The park’s remote location makes for exceptionally clear night skies, with views of an estimated more than 7,500 stars. Visitors can view the stars and constellations through a state-of-the-art telescope. Badlands National Park has many great opportunities for hiking where visitors can explore the rugged terrain, beautiful red and yellow mounds, and eroding canyons. The Window Trail takes visitors to a natural window in the Badlands Wall, with a view of eroding canyons. By looking at these historic canyons, visitors will quickly be able to tell that they were formed in layers – silt, sand and clay fused together over the course of millions of years. The longest trail is the Castle Trail. The trailhead is at the Door and Window parking area. The 10-mile trail takes visitors past many beautiful Badlands formations, and veers into the Fossil Exhibit Trail, which houses fossil exhibits and replicas of ancient animals that once called the Badlands home. The park is open all year, 24 hours a day. Entrance fees, valid for seven days, are $15 per vehicle, or $7 per person. The park operates two campgrounds at Cedar Pass and Sage Creek. Reservations are not accepted, but the campgrounds rarely fill up. Cedar Pass Campground is $15 a night, and running water, flush toilets and picnic tables are available. Camping in Sage Creek Campground is a more primitive experience. Camping here is free. There is no running water, but pit toilets and picnic tables are available. Badlands National Park has successfully reintroduced four species: American bison, Rocky Mountain bighorn sheep, black-footed ferrets, and swift foxes. Since the area’s establishment as a national monument, wildlife reintroduction efforts have been strong. The American bison, once bountiful, was nearly exterminated due to overhunting by the early 1900s. Now, nearly 800 bison roam freely within the park’s boundaries. The black-footed ferret is one of the most endangered mammals in the world. Once thought to be extinct, it was rediscovered in 1981 in Meeteetse, Wyoming. After the amazing discovery, Badlands National Park almost immediately began a captive breeding program. The National Park Service reintroduced the ferrets to the Badlands from Conata Basin. Today the ferret population in the park is about 300 individuals. The first people to cross through the Badlands area were mammoth hunters around 10,000 years ago. By the time European fur trappers arrived, the land was controlled by the bison-hunting Lakota Sioux Indians. Trappers, miners and American homesteaders slowly drove these native peoples out of the Badlands, but not without struggle. Conflict between the Lakota Sioux and the U.S. Army culminated in the Wounded Knee Massacre of 1890. Soldiers forced the remaining Lakota Sioux onto reservations at gunpoint. After the U.S. entered World War II, the Lakota Sioux land was used as a gunnery and bombing range. The government gave residents one week to evacuate. After the war, the U.S. government deemed the land to be “excess” and returned it to the Native Americans in the form of a government-held trust, and with the agreement that the land would also be part of Badlands National Monument. The Badlands National Park was established in 1976 under joint administration between the Lakota Sioux Tribe and the National Park Service. Today the Lakota Sioux live mainly on the Pine Ridge Reservation. 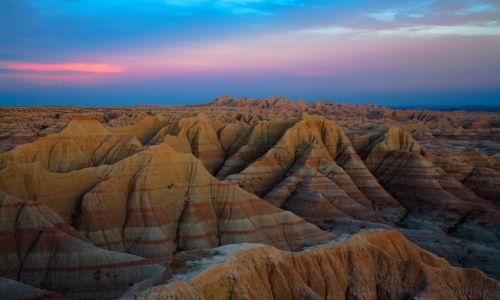 Fifty percent of Badlands National Park is located on the reservation. 1939 – The area is officially established as Badlands National Monument. 1942 – Badlands National Monument is used as a gunnery and firing range for soldiers during World War II. 1958 – The Ben Reifel Visitor Center is constructed for the monument. Click here to see the detailed Badlands National Park Map.